At the very least we should see a pull back in the markets. Planets in Earth signs should generate more caution and generally more stability in the markets. I’m looking for a slow trend down into early to mid Jan 2018. 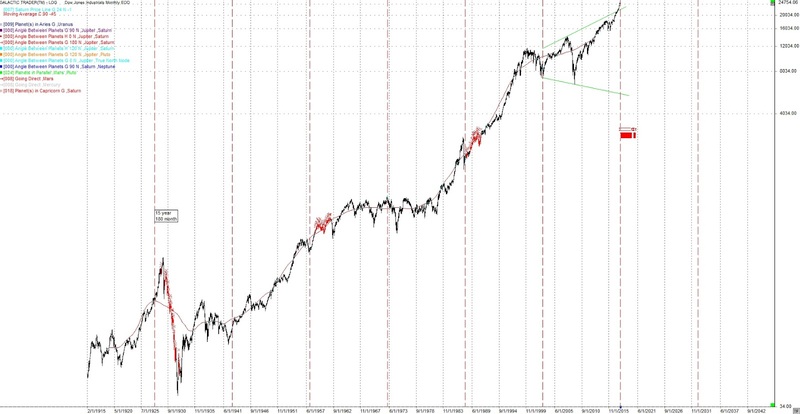 There is a longer term Market cycle coming due. That is the 9 / 18 month cycle as seen on the following weekly chart. I’m looking for the markets to start a move down between Dec. 18th and January 10, 2018. January 8, 2018 may be the bottom. We are in the midst of a powerful time band, December 16-January 14, containing 12 geocosmic signatures with correlations to reversals in financial markets. The midpoint is right around the turn of the year. Included in this cluster, in addition to the Sun/Saturn conjunction of December 21, is Mercury turning direct (December 23), Venus conjunct Saturn (December 25), Uranus turning direct (January 2), and both the Sun and Venus conjunct Pluto and squaring Uranus (January 9-14). Any one of these could coincide with a reversal in a financial market. All of them together, in a short span of time, increases the probability of a cycle culmination and reversal. With Uranus so prevalent, we cannot rule out the possibility of new record highs in some markets, and the breaking of major support or resistance zones, for Uranus has lately coincided with breakouts, as noted by the Jupiter/Uranus opposition of September 27, which coincided with the upward explosion in the price of both stocks and bitcoins. Before Dec 19 we had 6 planets in Fire signs and 1 in Earth signs. This will start to change Dec 19 with Saturn entering Capricorn. By Jan 11 there will be 5 planets in Earth signs. Does this mean more stability? Not if you look at January and February. In particular there are 2 Super Moons in January and then a powerful Solar Eclipse on Feb 15. More on this powerful earthquake and earthquake’s in general in late January’s post. Beyond currency and money in general 2018 may be known as the Year of the Earthquake. I would include Volcanos as well. Look for the start in the first 2 months of the year. Generally speaking the first couple of month of 2018 should be volatile. There are 2 Super Moons and 2 Eclipses. Both eclipses are strong but the strongest should be the February 15 Solar Eclipse. This is almost opposite the August 21st eclipse last year. Both are in late Fixed signs. Remember all the violent weather we had after last years eclipse and the continuing aggression. More on this as we get closer. In May Uranus will enter Taurus. Look for financial or banking system problems or changes. Taurus will go retrograde and then move backward into Aries before Uranus enters Taurus for good. This may also be a problem in currencies. Several respected market analysts are projecting gains of 10% or more in U.S. equity prices for 2018 now. They could be right, for Jupiter (optimistic) in Scorpio (taxes) will continue to trine Neptune (euphoria and profits) through August 2018. Furthermore, the Saturn/Uranus trine returns to an almost exact aspect in August-September 2018 too. That aspect has been effect since December 2016, and has a 100% correlation to 4-year or greater cycle crests in the U.S. stock market’s history. The following monthly chart of the DJIA shows when Saturn has been in Capricorn (red x’s). Notice they have all had significant drops. This chart also has the 15 year cycle which will be coming due in 2018.